Playaboule patented product, exclusive New Design V3. 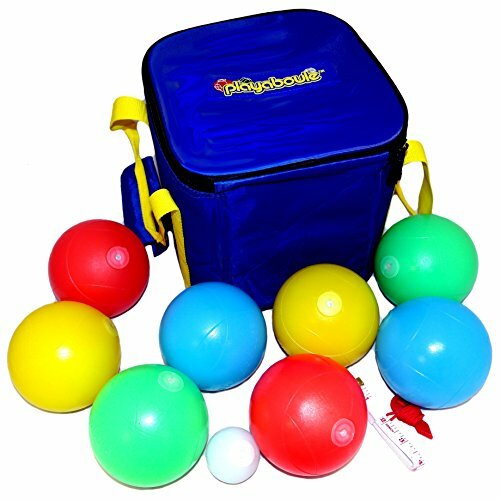 Lighted bocce ball set for the beach, backyard, camping. Light up bocce ball set with LED is the only US Bocce Federation official sized 4.2 inch dia (107mm) glow (LED) bocce balls available. All the features that follow are not in the older V1 design copied by another company. External recessed push button switch (don't need to screw in/out) for day and night use without having to remove the batteries, water and sand/grit resistant, double function of flashing AND non flashing built into switch, quick release battery enclosure does not require a screwdriver, US Bocce Federation regulation size 50mm (2 inch) target ball (pallina), heavy duty carry case, rules, 2 x simple measuring devices and 1 set of batteries in blister pack. If you have any questions about this product by Playaboule, contact us by completing and submitting the form below. If you are looking for a specif part number, please include it with your message.